David John Lang is an Australian composer living in Adelaide. He writes music for orchestras, choirs, singers and instrumentalists, always seeking to create art that is inventive, thoughtful and heartfelt. His music often reflects his love of storytelling, his Christian faith, a whimsical sense of humour and an instinct for drama. David is very thankful to the many different artists and ensembles who have brought his music life. Musicians who have taken up this task include the Australian String Quartet and the Adelaide Wind Orchestra. Many groups and individuals have also commissioned works from David, including Adelaide Youth Orchestras Inc., Adelaide Chamber Singers and Eclectica Trio. In July 2016, David attended Composing in the Wilderness, a two-week adventure in back-country Alaska with nine other composers, led by Stephen Lias. In 2012 he was a composer at the four-week Atlantic Music Festival in Maine, USA. He has also attended three of the Australian Youth Orchestra’s National Music Camps, twice as a composer and once as a writer. 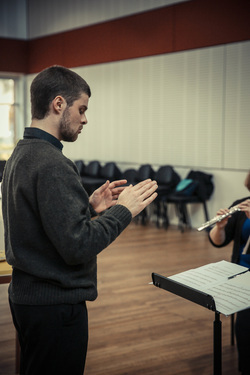 David won the International Composition Prize of the Reveille Trumpet Collective in 2011, and has won numerous South Australian Young Composers Awards. David studied composition at the Elder Conservatorium of Music with Graeme Koehne, David Harris, John Polglase and Charles Bodman Rae. He has also had occasional (but significant) lessons with Robert Paterson, Andrew Thomas, Iain Grandage, James Ledger and Andrew Schultz. When not writing music, David loves writing about music. He has provided concert program notes for organisations including the Australian Chamber Orchestra and the Adelaide Symphony Orchestra, and was awarded the Australian Youth Orchestra’s Music Presentation Fellowship in 2010. David is also an experienced conductor of choirs, orchestras and chamber groups. He is the assistant conductor of the Adelaide Wind Orchestra, but when not required to wave his arms around out the front he can be found in the trumpet section. When David remembers there is more to life than music, he enjoys reading, walking (especially in the Adelaide Hills) and eating good chocolate. Often these activities inspire more music!